Merry Christmas! I hope you are all having a wonderful day. 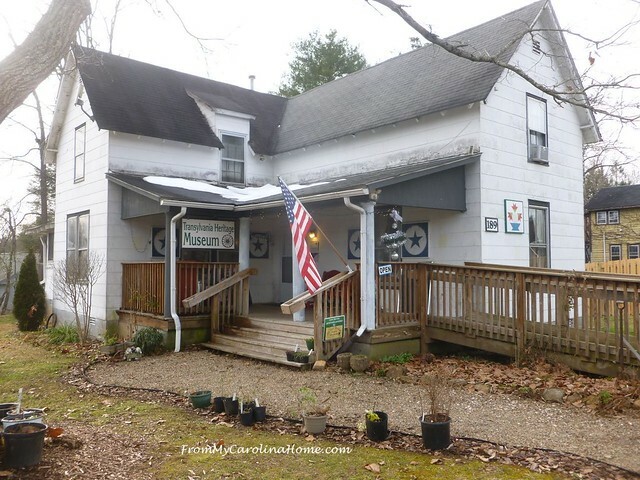 I thought it would be a fun day to show you a unique exhibit at the little, old house that is the home of the Transylvania Heritage Museum. The exhibits change regularly, and each December they bring out a most unique collection. 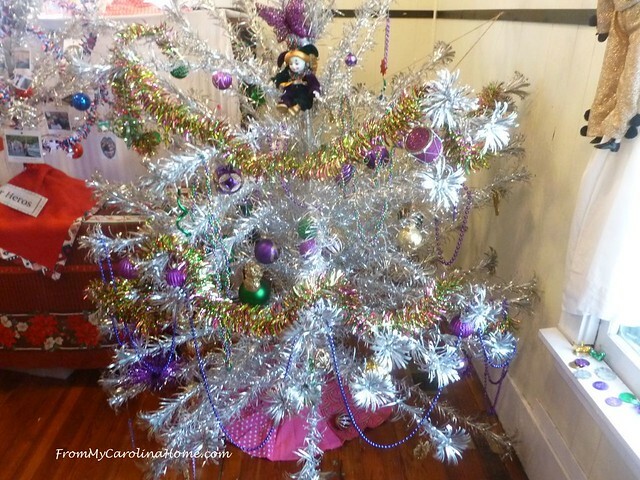 Yes, those are aluminum Christmas Trees. The ATOM organization sponsored the exhibit, tongue in cheek for Aluminum Tree and Aesthetically Challenged Seasonal Ornament Museum. 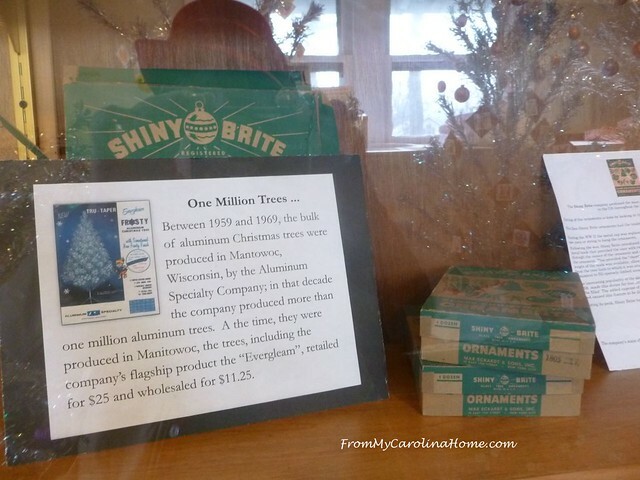 Aluminum trees got their start when a Toy Sales Manager for an aluminum toy company, Tom Gannon, saw a small aluminum homemade tree in the window of a Ben Franklin store. The tree design was patented in 1958, and began selling in 1959. They were marketed as Space Age ‘Permanent’ trees. The curator of the collection is Stephen Jackson, who fell into his collection by being the recipient of a gag gift. A friend of his gave him an aluminum tree rescued from a trash pile for fun. Later he got more, then began to actually collect them. They have an interesting history to them too. They were a big fad in the 1960s. 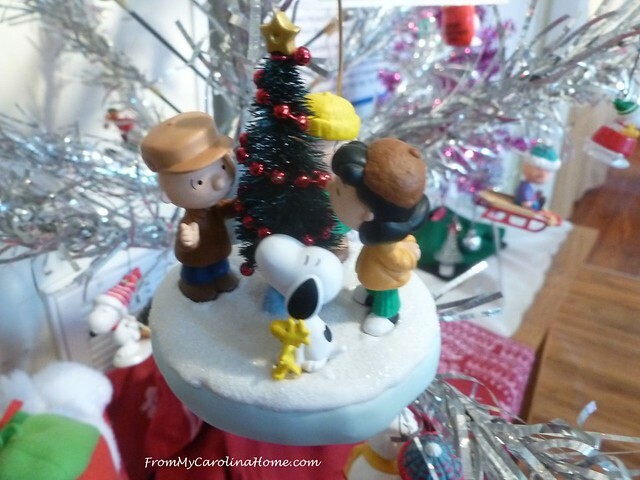 When the television special A Charlie Brown Christmas first aired in 1965, it marked a turning point for the trees as Linus and Charlie Brown deride the commercialism of Christmas. By 1968, the aluminum tree was gone from catalogs and most retailers. A few were made into the 1970s, but then they stopped being made altogether. 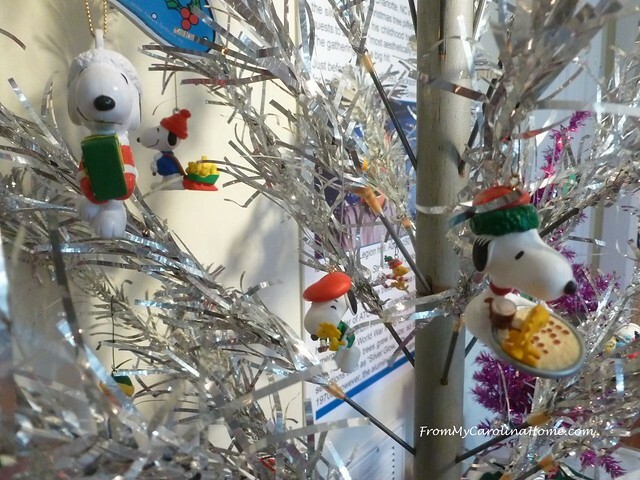 Naturally the museum collection has a Charlie Brown decorated tree with plenty of vintage Snoopy ornaments. I have a few of those on my tree too. 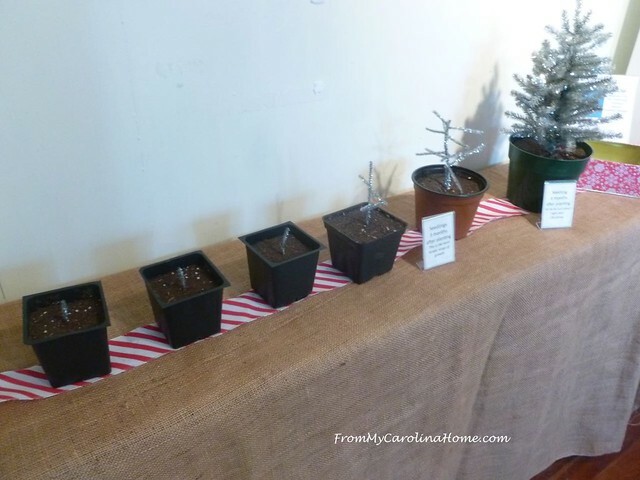 The curator has a sense of humor too, with this exhibit showing the germination and seedling process of growing an aluminum tree. 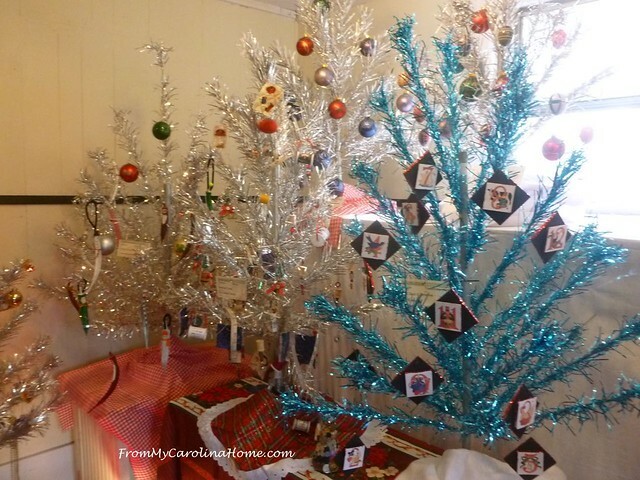 There were a couple of dozen trees in the three exhibit rooms of the house, all decorated with different themes. This one was Mardi Gras. At the height of its popularity, there were 36 American manufacturers of aluminum trees along with 3 in Canada, one in Australia and an unconfirmed report of one in the Soviet Union. The trees were mostly produced in silver, but they also made them in blue, green, pink, and red. The ‘needle’ designs included the ‘Twist and Curl’ style seen mostly in this exhibit as well as pom-poms. I remember having these ‘Shiny Brite’ ornaments when I was a kid. Did you have those too? A lot were needed as there were over one million aluminum trees made and sold in just 10 years by one company alone. One of the trees had a sewing theme, cute with the measuring tape as garland. Amazingly, there were a few of the original boxes on display too. 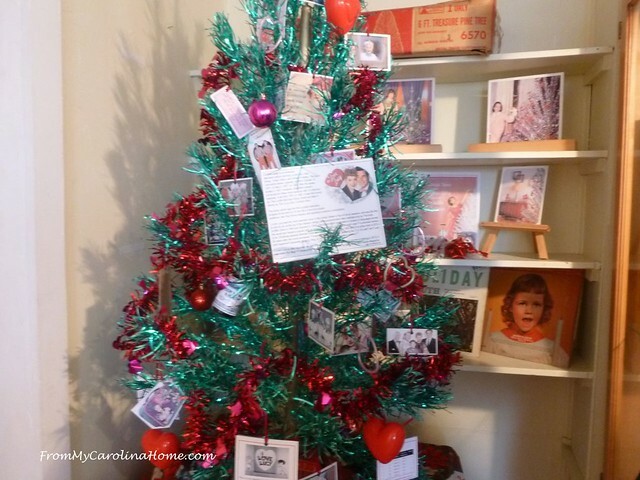 One green tree is in the collection, decorated in a Lucy and Desi theme. 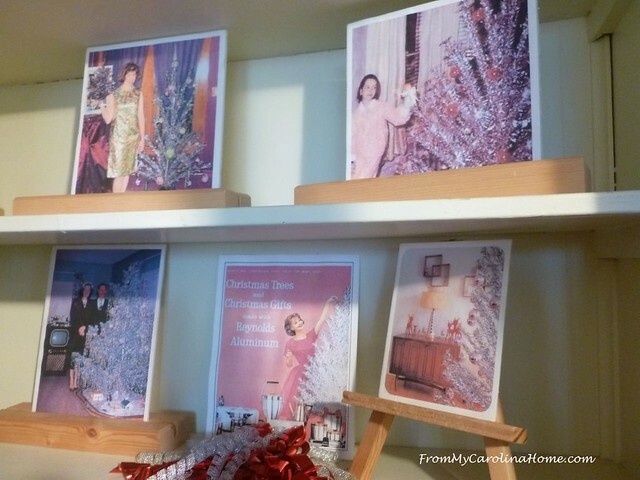 On the shelves behind the tree, several photographs of real people with their aluminum trees from the 60s, along with a couple of ads. 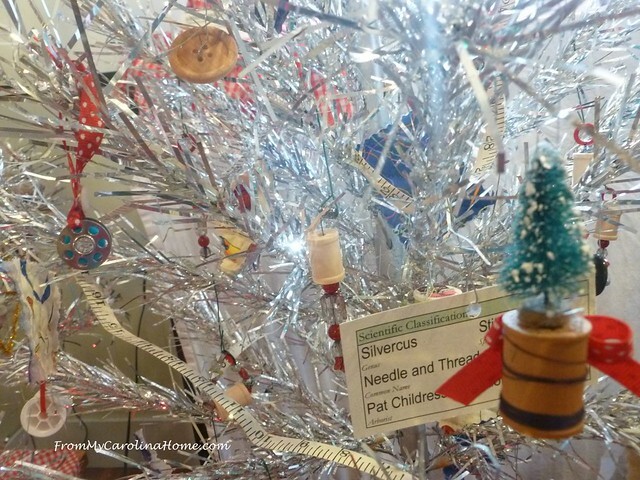 I do remember my mother talking about having an aluminum tree because it wouldn’t shed needles in the carpet, but I do not think we actually did. I cannot imagine my father ever going for such a thing, as we had real trees every year. I do believe we had one of these lights on the floor here, that rotated colors. But I seem to remember that it was outside projecting the colors on the front wall of the house. The tree on the left below was decorated with pictures from Brevard from the mid 1900s. A Halloween inspired tree on the right, sits next to a red and silver themed one. Trees were made in all sizes, ranging from as small as 2 feet and up to 8 feet tall. There were several table top size trees on display. These vintage trees are now, as you might expect, somewhat collectable, with larger ones in mint condition going for over $700! Not bad for something rescued from the trash heap! I hope you enjoyed the trip to the museum. 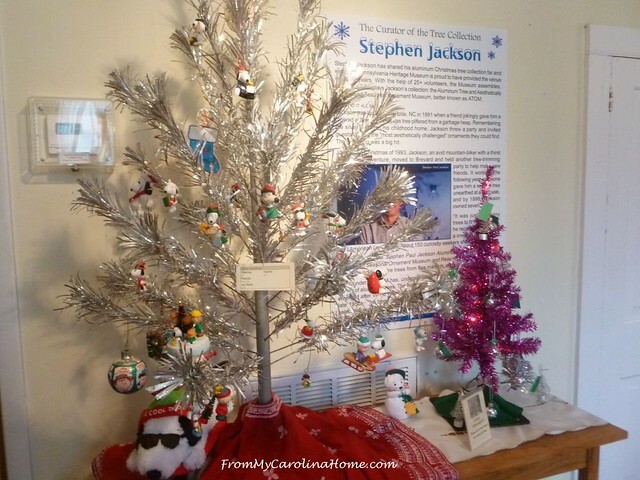 I did a tour of the local B&Bs Christmas decorations a couple of years ago, if you are in the mood for more. See the Holiday Tour of Inns post for the first part. Wanna shop? Craftsy is having an End of Year 70% Off Clearance! Clearance Sale – Up to 70% Off Kits & Supplies It’s the last sale of the year – and the savings are huge! Merry Christmas, Carole. Thanks for the tree tour. That sounds like a cool museum. 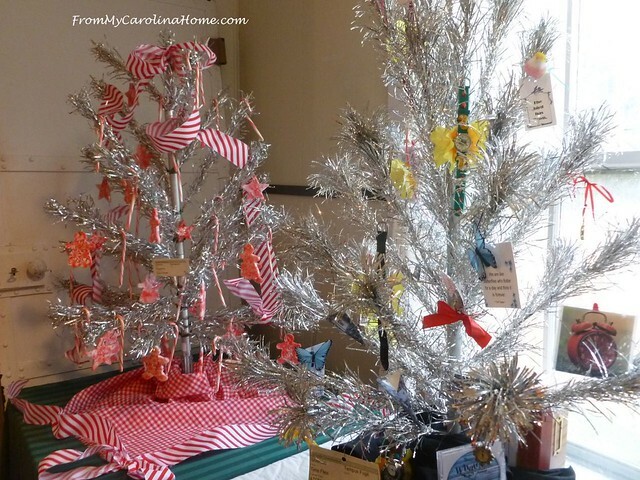 I remember my grandparents had an aluminum tree. They only had blue ornaments and blue lights on it. Growing up, I thought that was a most beautiful tree. Thank you for sharing the story. My son sent me a picture yesterday as he was at a house with an aluminum tree… I too have 2 aluminum Christmas trees with the light and blue glass balls in the original box —-in my attic. The trees were given to my husband when his grandfather passed away. We actually displayed it in our bedroom for a couple christmases. Now it makes me want to pull it out again and display —next year for sure. I shared the story with my husband and kids they will enjoy. Thanks Carole and Merry Christmas! I remember those. I loved this tour! I always thought they were tacky but now I kinda like aluminum trees! Merry Christmas! Thanks for the tour of the museum. What a fun tour to take on Christmas morning, thanks for sharing it. Merry Christmas! Merry Christmas to you and your family! May you have a Blessed Day! 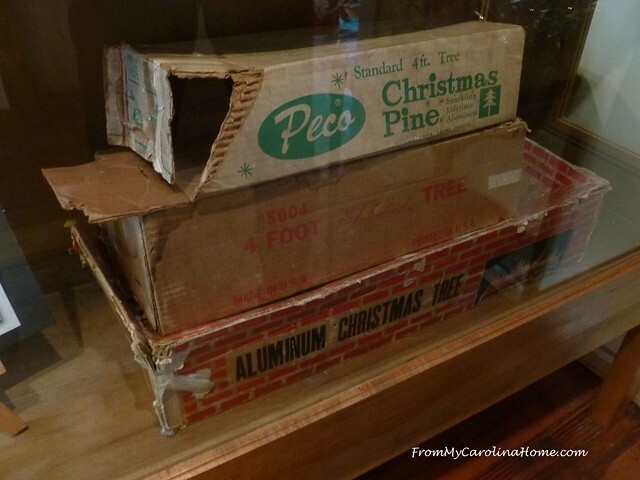 We did have an aluminum tree including the rotating light wheel (and it may still be in the attic!). Thank you for sharing the pictures. I especially like the ‘germination’ display. Merry Christmas to you & your family. I always enjoy your blog. My Mother had one of these trees with the multi-color light that shined on it. She loved it and put it up for years. It was never one of my favorites. Brings back memories. Thanks! Merry Christmas, Carole. Thank you, for the wonderful post. I’m sure you there will be many fun conversations started because of it. All the best to you and yours. Another wonderful stroll down memory lane. We never had an aluminum tree, but I do remember them. All our excitement was last night so now I’m free to sew the day away. Swoon!! The Christmas tree of my youth. Sigh… Such wonderful memories. Thanks for sharing the museum with us. Merry Christmas! What lovely memories! A friend of my parents had one of the aluminum trees (elegant, just like she was) and one year her son mounted it on the ceiling, on a rotating base. To my very young eyes, it was magical! It was probably 1961, so the tree was relatively new. What a wonderful memory this brought back…thank you! I hope you have a blessed Christmas! Walmart actually had a good 4-5 aluminium tree this year–and I had planned on getting one after Christmas on sale–but they sold out–it was nice and slim and I think it would of been fun to decorate next year. My Aunt Cora had a table top aluminium one years ago with that colored light thing by it–but we always had real trees–thanks for the memory! This is awesome! My Grandmother had an aluminum tree with the rotating color light. I LOVED it. Hello Carole and Merry Christmas to you and your Husband! Your post today was filled with fun and wonderful memories for so many readers. I do not remember them, yet, I am sure that I may have known someone with one. Having been raised in Wyoming, real trees were very expensive and a lot of people had artificial trees. Thank you for sharing. I am sending you warm wishes and a great big hug, plus Miss Dodger and Mr. Shakes send delightful kisses!!! What a fun exhibit! You find such unusual things to blog about, I always enjoy reading! Merry Christmas! 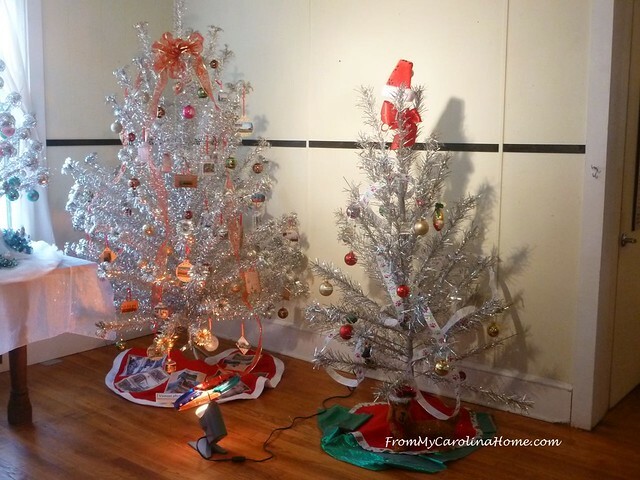 We had an aluminum tree when I was in my early teens with the rotating light. We loved it, but my sister’s poor kitty was less than impressed. She (the cat) went running across the wool carpet and jumped onto the tree. The shock from the combination of the wool carpet and the aluminum tree sent her flying across the room. After that she never went into the room where the tree was again! That is just fun! I remember the aluminum tree with the rotating light at the Doctor’s office in Thief River Falls. Every week I watched it turn colors, definitely made the time go faster while I waited ! What a wonderful collection. Such a great display and a history lesson as well. Loved seeing all the photos. Thanks. I grew up with an aluminum tree. We used it for many years. We had the little turning lights also. 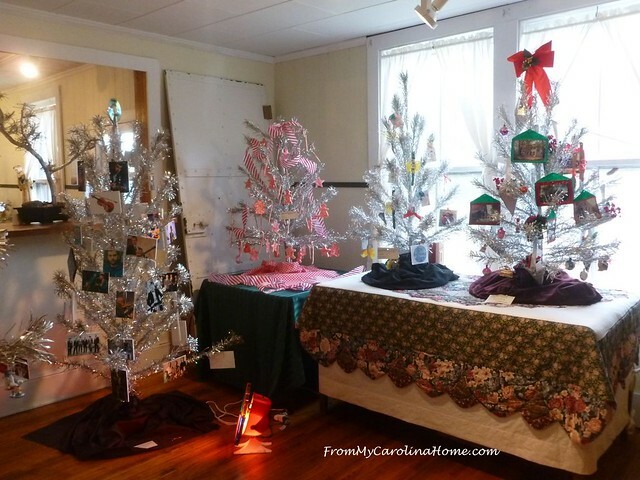 With the only source of heat being in the living room trees dried out to quickly so mom loved the aluminum tree. She eventually donated it to the grade school she worked at because one of the kids in the classroom was allergic to pine trees. That tree followed him thru all his years there at the school. By then mom and dad had moved to a bigger house with center heat so they had live trees again. How well I remember the aluminum trees. I still have one for a table top. Didn’t use it this year cause I used my fiber-optic tree with gift boxes of different kinds of gift boxes under it. Had a cylinder container to store fruit cake cookies in as a gift along with the peacock umbrella for my friend I told you about earlier. 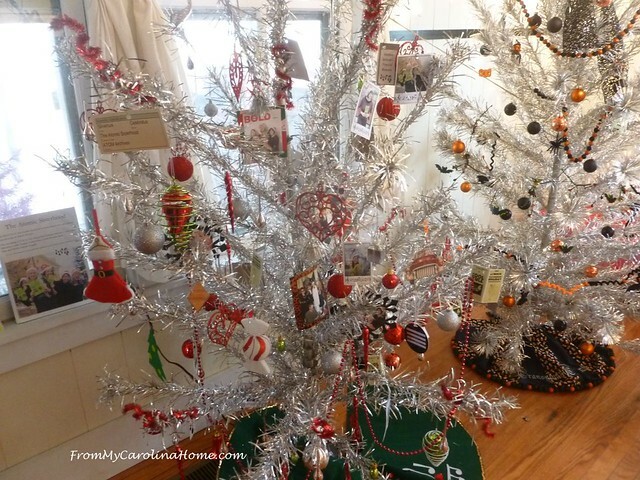 Want to use my aluminum tree next year with all my little snowmen and women on in den. I’m in the process of going through all the decorations I’ve had for the past 50 years or so and deciding just what I really want to keep for now. Seems like the older we get the less we want to put out unless we have some help, right? My Christmas was saddened by the passing of one of my dearest friend of 53 years on the 21st but I know she is better now she is with The Lord and has no pain, I just will miss her till I see her again in God’s timing. Wishing you and yours a Happy New Year with lots of blessings, Phyllis Smith.